Project Updates: Exclusive "X-Men: Days Of The Future Past" Teaser Images Revealed! We don�t get a look at anything really different in these images. We still see signature characters from the First Class and original X-Men universes, starting with Hugh Jackman�s Wolverine (at the very top) to Jennifer Lawrence, Michael Fassbender and James McAvoy as Mystique, Magneto and young Professor Charles Xavier, respectively. There�s a longer list of anticipated Days of Future Past elements that we haven�t seen yet, and still hope to when the long trailer finally comes out. The number one item on that list would be Sentinels, of course. Quicksilver and Bolivar Trask are on that list, as well. Singer has teased what his towering, mutant-hunting robots are going to look like, but we need to see them in action on screen, and not hidden in smoke, like Brett Ratner tried in his cutesy Danger Room sequence from The Last Stand. Singer�s return to the X-Men universe plays off the immensely popular Days of Future Past storyline, which takes place in two different time periods (and will allow Fox to use its entire arsenal of on-screen mutant actors). In this version, based on what we�ve been lucky enough to see, an older Wolverine (Jackman) will be sent back to the 1970s by Xavier (Patrick Stewart) and Magneto (Sir Ian McKellen) to interact with a younger Professor X (McAvoy) to prevent the rise of a powerful villain who could bring about the end of humanity. It�s a hefty story, and Singer�s challenge will be finding room (and screen time) for every hero. Look for the trailer next week, and the movie in theaters on May 23, 2014. Gallery Updates: Exclusive Complete Sets Of September 2013 Candids Finally Added! Finally my ability to catch up with many of Hugh's missing candids really had gone to the maximum as I had finished searching and adding up with almost over 5 sets of high quality yet very rare candid appearances of Hugh for this September 2013 only. Actually there will be more to come around next week once I settled my professional life conflicts first. I have found these all gorgeous sets of candid appearances images taken from various dates so head over to the gallery to view the rest of the images addition and enjoy the previews below! New Appearances: Hugh Jackman Attended Premieres in Beijing + More Appearances Added! Thank you for the amazing support and Hugh was simply having a blast with his birthday wishes. Hugh had been around China pretty much for promotion of "The Wolverine". So I have added appearances images from Hugh while he attended the premiere of "The Wolverine" and also some images when he was attending the US Women Opens with his wife. So head over to the gallery to view the rest of the additions and enjoy the previews below! New Appearances: Hugh Jackman Birthday Concert + Beijing Press Conference Added! Thank you for the amazing support we had been receiving all these years and we are truly glad with the greatest fans we are having here. Well right back with our updates today, I have added images from Hugh very recent appearance in Beijing while doing a press conference for "The Wolverine" there with fans. Also before that, Hugh had been celebrating his birthday with his "One Night Only" charity performance in Dolby Theater. So head over to the gallery to view the rest of the additions & enjoy the previews below! Home > Public Appearances > Appearances 2013 > Beijing Press Conference For "The Wolverine"
New Appearances: Hugh Jackman Latest Public Appearances Catching Up With! Thank you for all the support, Hugh had been busy throughout the years of 2013 promoting his movies from "The Wolverine" to "Prisoners" and he had been going all out in promoting these huge blockbuster films. Hugh also seen attending few events related to the launching of "Prisoners" along with his wife Deborra Lee. I have added over 100+ images from all 5 events of the launching of his films so head over to the gallery for the additions and enjoy the previews below! Home > Public Appearances > Appearances 2013 > Official Academy Member Screening Of "Prisoners"
Site Updates: Happy 45th Birthday To Hugh Jackman From Us! Finally, its the day and it has arrived!Happy 45th birthday to our beloved actor Hugh Jackman!Hugh had been a wonderful actor and person for all these year and we hoping he would be receiving the best for his many more years career to come and spent it wisely with his family. Also to all our visitors we hoped you had enjoyed participating in the Hugh Birthday Project hosted by People Magazine so enjoy the evening and have a very Hugh Jackman day ahead! 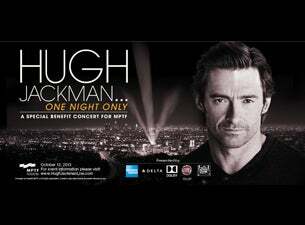 New Appearance: Hugh Jackman One Night Only Purchase Tickets Now! The talented Hugh Jackman is bringing his critically acclaimed Broadway show to the Dolby Theatre in Los Angeles on October 12th for an exclusive one-night only performance. The show will feature musical entertainment, special Hollywood film moments, a live auction & much more! All proceeds raised from the event will benefit Motion Picture & Television Fund (MPTF). To attend follow the link below while tickets sales lasted! 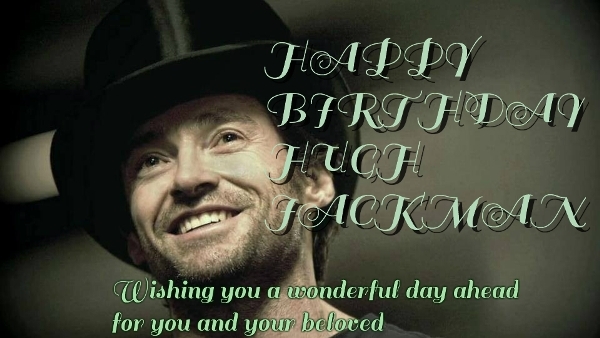 Site Updates: Help Hugh Jackman Celebrates His 45th Birthday with People.com! Australia's biggest movie star is blowing out 45 candles on Oct. 12. To celebrate his big day, we're asking Wolverine's biggest fans to help PEOPLE and causes.com wish the former Sexiest Man Alive a happy birthday! In honor of Hugh's birthday this coming weekend, we're asking fans to submit birthday tribute pics of themselves on our site -- anything showing their love for Hugh. We're working with him on a charity event this weekend, and the plan is that he'll be sending us a video thanking fans for their birthday wishes. It's simple: Create a cool birthday greeting for the multitalented star (get creative! ), take a pic and upload, Insta or Tweet it for a chance to appear on PEOPLE.com � and maybe have your photo seen by the heartthrob himself! New Appearances: Hugh Jackman On Tour Promotion For "Prisoners" In Zurich! Thank you for still sticking around with us here at Hugh Jackman Central I had been busy behind the scene updating our gallery with all the latest from his appearances in Zurich. Hugh had also won the coveted Gold Icon Awards from Zurich Film Festival so we here would like to congratulate him on the winning. Here we have updated 6 sets of appearances that Hugh had made throughout this month so head over to the gallery to view the rest & enjoy the previews below! Site Updates: Hugh Covers Magazines For Modern Luxury By Warwick Saints! Hugh had manage to be on covers of top magazines that brought together in Modern Luxury theme which being photographed by Warwick Saint. Some of the magazines included are "Manhattan", "Jezebel" & "Safari" to name a few. Hugh look tremendously charming and smoking hot with his dark suits which compliments his good look and body. I have added the rest of the scans from these magazines including some image clippings so head over to the gallery to view the rest and enjoy the previews below! Project Updates: Hugh Jackman to Star in Neil Blomkamp's 'Chappie'! This summer's sci-fi spectacle "Elysium" was wildly anticipated, and rightfully so: it was the sophomore feature by Neill Blomkamp, the young visionary behind alien-infested apartheid allegory "District 9." And while "Elysium" didn't quite live up to the astronomical anticipation, it did cement Blomkamp as a fearless genre filmmaker, one willing to try just about anything in the service of his far-out fantasies. His next feature is "Chappie," a dark robot comedy about an android cop kidnapped by ruthless thugs. Sounds pretty wild, right? Well, as if you needed another reason to get pumped, Hugh Jackman has now joined the cast. Jackman will play the rival of Dev Patel's character. Sharlto Copley, Blomkamp's BFF who made an international splash in "District 9," before playing a ruthless bounty hunter weirdo in "Elysium," will be providing the motion capture performance for the robot. And Die Antwoord (nee Yo-Landi Visser and Ninja), the South African rap duo known for their outrageous music, performances, and videos, will portray the gangsters. Jackman is coming off a super strong 2013, in which he started off the year with his very first Academy Award nomination for Best Actor (for "Les Miserables") and continued with two wonderful performances in James Mangold's superhero saga "Wolverine" (weirdly underrated, considering it's a giant studio contraption) and, currently, in "Prisoners," an essential thriller in which Jackman plays a father tortured by the disappearance of his young daughter. It's a performance that's so good that it could signal Oscar nomination number two. Not much else is known about the film, although Blomkamp had previously described it as being like a really funny version of "RoboCop," apparently missing the memo that "RoboCop" is already really funny. "Chappie" is expected to be released in 2015, alongside every other movie ever. New Appearances: More Catching Up On Hugh's Latest Appearances Finally Added! During this promotion of Hugh wildly awaited "Prisoners" which had been a huge success and could help Hugh in winning an Oscar, Hugh had attended quite various premiere and events associated from Berlin Film Premiere and San Sebastian Film Festival. Hugh also lately had been awarded Donostia Awards from San Sebastian Film Festival. Hugh looking handsome as always with his sharp dressing and I have added overall 500 images from 6 variant of events he attended. So head over to the gallery to view the rest and enjoy the previews below! Gallery Updates: Miscellaneous Interviews/Talkshows Featuring Hugh Added Online! Hugh had probably going through the best phases of his career in Hollywood by doing "Prisoners" and he attended quite variety of talkshows from around the world promoting the movie. I have collected these various press junkets interviews including some of talk shows which he participated so I have just capped over 2500+ screen captures from these clips. Head over to the our image gallery to view the rest of the additions and enjoy the previews below! New Appearance: Hugh Jackman Visits "The Ellen Show" For Oscar Hosting Discussion! "Sure! I'd love to. But unlike you, I'd want to be unemployed at the time. Which is a weird thing for an actor to say!" Ellen plans on prepping for her big night at the Oscars while STILL working everyday on her talk show! Mr. Jackman thinks that is just BONKERS and the superhero stunner offered to rescue her, if she ever needs him to fill in for her! He offered to take over for Ellen on her show while she prepares for the Academy Awards! And Ellen seemed keen to the idea! New Appearances: Hugh Jackman Attended Few Talkshows For Promoting "Prisoners"! Just a quick updates on Hugh where about this weeks where it seemed like our Hugh definitely being busy for tour across the country in conjunction of the "Prisoners" all out promotion. Hugh was also spotted later attending few prestigious talkshows for the same purposes so I managed to catch up on a few of them so head over to the gallery to view the rest of the additions of 2000+ stills & screen captures from the talk shows segments and enjoy the previews below!